French police have arrested a man suspected of sending death threats, along with bullets, to President Nicolas Sarkozy and other politicians. The man, a military reservist in his 40s, was detained at his home in the southern city of Montpellier. Mr Sarkozy and eight other top French politicians received death threats in letters stuffed with bullets. The mysterious, identical 20-line typed letters were full of spelling mistakes and abusive language. 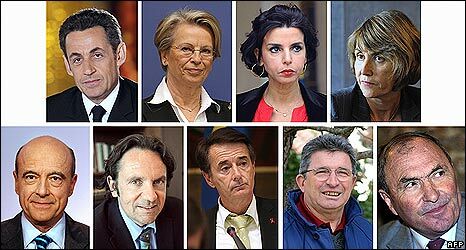 Senior members of Mr Sarkozy's centre-right UMP party were targeted, along with three cabinet ministers. Justice Minister Rachida Dati and former PM Alain Juppe were among them. Interior Minister Michele Alliot-Marie and Culture Minister Christine Albanel also received such letters. They contained 9mm or .38-calibre bullets, officials said. The motivation behind the threats was not clear. The Associated Press reports that the letter speaks of a mysterious "Cell 34", mentions 1,000 combatants, and describes the recipients as the legislators of "liberty-crushing" and "fascist" laws. The letter concludes with the statement: "This letter is the last. There will be a black out. Total silence."